The JLA quickly dispenses with a major meta-threat in the downtown of a major Metropolitan city. President Luthor claims that the threat originated in the nation of Quarac. A country with a history of terrorist actions. The JLA is unconvinced by the thin evidence that Luthor uses to connect the attack to Quarac. Luthor feels the terrorist actions warrant a first strike against Quarac to avoid further loss of American life. The JLA rush out to find the mastermind of the terrorist attack and their investigation leads them to the doorstep of Doctor Ivo who puts up a super science fight that crumbles under the pressure of the JLA might. Ivo refuses to give anything up or speak without the presence of an attorney. Meanwhile across the country people are irrationally preparing for war by stocking up on mundane items the government claims will prevent harm in the event of terrorist attacks. Even Lois appears to be caught up in the mayhem. The JLA continues to argue the point with Lex but he's dead set on his first strike plan. New evidence of possible weapons of mass destruction in Quarac support his ambitious goal. In Gotham City army special forces officers prevent protesters from boarding trains to a larger protest against the impeding war. Batman and Superman swoop in and Batman makes short work of the special forces allowing the protesters through, but somehow none of this sits right with Superman. Everything is getting out of control. Big Blue meets with Luthor back in Metropolis to discuss alternative routes to war. But Lex is insistent on his belief that it's un-American to not support this war. Lex's mission statement seems right and justifiable but something about his words denotes an immoral approach to justice. A new American way that doesn't work for the Man of Steel. Superman grows a back bone and finally speaks out against the president and challenges his authority. Lex reveals a suitcase containing a Kryptonite heart that vaporizes Superman in a horrific blink. Suddenly Superman wakes up in a dream chamber somewhere in the JLA watchtower. Batman and Wonder Woman are by his side. In attempt to unburden his mind of anxieties Superman used the machine to examine his unconscious mind. Without a telepath this treatment is apparently very dangerous. But it has reminded Superman that the truth out weighs all else. Story - 3: When People hear Superman's motto "Truth Justice and the American Way" they forget what the American Way really is. It doesn't mean that Superman represents the elected officials, or that he reflects some 200 year old document. It's a signification originated by his creators that Superman would be a champion for what America SHOULD be, even if that's not what it is. Meanwhile Lex has always represented the ideals that threaten to over shadow what it is Superman represents. Lex Luthor has always represented evil in the establishment of the real world. During the age of atomic power Lex was a scientist always on the verge of destroying us all. During the 80's Lex became a "Gordon Gecko" manifestation of corporate greed. And now in a time where we don't all trust the motivations of our political leaders, Lex has become the President of the United States. When the decision to make Lex President came to light a few years ago I thought it was a genius move. The first 20 pages of this book are phenomenal. Superman makes a real decision to stand up against the system and fight for what's right... Then he wakes up and my excitement was severely deflated. A dream?!? Why?!? This story was fantastic (Save for Batman drop kicking a cop)! I would have loved to have seen it expanded and explored. Superman is in a perfect position to be marketing itself to young college students who are protesting foreign wars waged in their name. Superman is primed to fall back into his role of representing the little man, and capitalizing on it by making him cool to the masses again. When Superman was created 65 years ago he was the people's hero cracking down on wife beaters and public corruption. Now I'm aware that doesn't make for the most exciting comic adventures in the modern era but the concept rings more relevant than ever. It was until post-WW2 during America's do-no-wrong period that Superman became a bland vanilla representation of what he was and Superman was tied in with the establishment. As time went on, however, and America lost her way Superman stuck by the sides of the powers that be despite his original rebel qualities. This story sets Superman on the path to reconnecting with his roots and then trashes the bold concept with a dream cop out. I would like to have seen this story placed in Action Comics and expanded upon. The idea of Superman rediscovering his place in the modern world is a lot more interesting to me then Superman beating up on a new version of Zod. Because as long as Superman is just a comic strip with some crazy buzz words about super powers he'll only be regarded by the world as a stick-in-the-mud authority figure as opposed to the relevant allegory for the common man with the power to affect change that he really is. Art - 4: I've never seen Cross' work before but here it appears very clean and the story pace is excellent. On occasion he could use some heavier shadowing across the main characters in the story to help them stand out from the back ground players. Aside from that I was pleased, but I'm starting to miss Mahnke's gritty pencils. 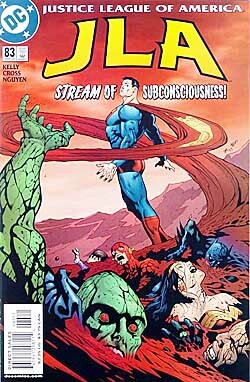 Cover Art - 4: I dig the concept of Superman's team mates drowning in his own indecision, and the colors are fantastic. Not to be a jerk but Manhunter isn't on the team anymore.